Trying to turn ping pong from a Saturday-afternoon hobby to a lucrative, money-making profession? Finding that table tennis mittens just aren't getting you to the finish line any faster? Here's your latest training tool: iPong. Yes it uses the completely played-to-death i[Product] format, but it still looks like an awful lot of fun. In baseball/softball, you don't always have a friend to pitch you the ball and help you with batting practice. So you go to the batting cage and take advantage of an automatic pitching machine. 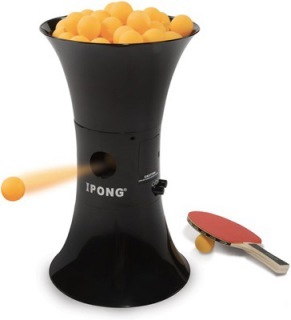 While the threshold for practice partner is a little lower for ping pong, you still don't always have someone to practice with, so the iPong hurls balls your way and lets you test and improve your reaction time and return. You can adjust between 12 and 70 balls per minute. You can pile in a heap of ping pong balls (up to 110) and just practice drilling them for hours at a time. Actually, you'll probably have to reload a couple of times before you get hours of practice, but you get the idea. You can even choose from three spin settings: top spin, heavy top spin and under spin. DIY Blood Type Test Kit? In the Toy Section? This invention is really cool! My old boss used to have a ping pong trainer and she became very good at the game... this works just like in baseball with Pitching Machines (you can see a selection at pitchingmachinesuperstore.com).